Who is the Moonstone thief? Who stole the Moonstone diamond? Is it cursed? 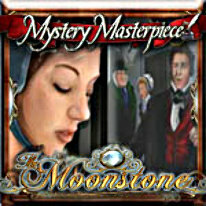 In Mystery Masterpiece The Moonstone, it's up to you to investigate and unravel the mystery! Investigate every person that was in the mansion at the time of the crime. Hunt for clues to uncover the thief and locate the ancient jewel! Explore every room to find valuable clues in Mystery Masterpiece The Moonstone, and return the enormous diamond to its rightful owner.